...or for the trail ! 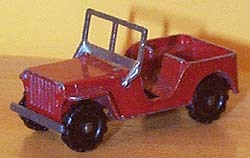 The most readily available of the Majorette Jeeps is the 1:56 scale CJ-5 model which is part of the popular 200 series. It was initially released as #268, with a standard chassis and street tires. A "Golden Eagle" model with white hard top was one of the early variations. The 300 series were two-packs, which included the CJ-5 towing a race car. Several paint schemes exist, and both regular and (later) lifted chassis were used for these sets which were numbered #318. The two-pane windshield of the exported CJ-5 was used instead of the U.S. one piece design, which also helped to reinforce the vulnerable windshield frame. Majorette started producing die cast vehicles in France in 1961. Through the sixties and seventies, the availability of Majorettes in North America was very low, and most were sold as promotional toys by retailers such as gas stations. With the establishment of an American headquarters in Florida, Majorette vehicles became readily available in 1982. By this time, the Majorette wheels had been changed to the competing "Hot Wheels" style. 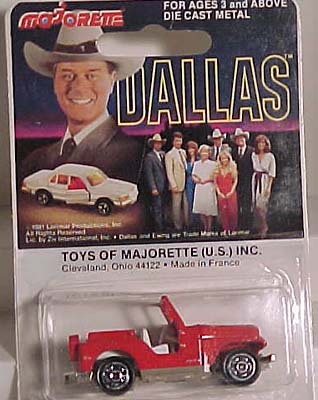 See also Majorette Large diecast Jeeps and Majorette diecast Cherokees. 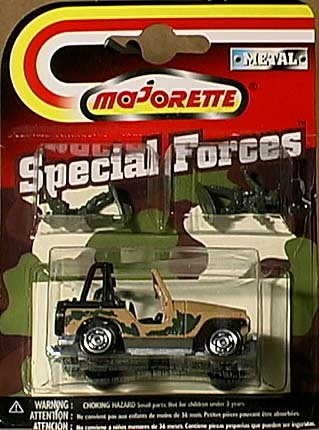 The first Majorette Jeep was their model #7 in 1965, which was available with various trailers and was based on the Hotchkiss version of the Willys MB, manufactured under license in France. In 1970 it became #107 in the 100 series. The model's bare metal windshield folds down, and the slats in the grille go right through the casting, as opposed to the usual indents found in this scale. This metal 1:65 scale model has a rear tow hook and solid plastic wheels with large treads which restrict free rolling. 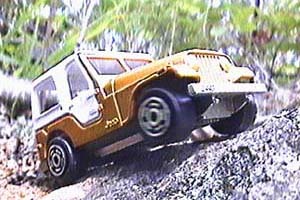 For more early French models see the Jeep Toys Made in France page. The 200-series CJ-5 casting also appeared in the 220 series as #220-7. These Majorette Special Forces (40K JPEG) military versions included two soldiers. One variation of this model is a lifted green Jeep with a black hard top, while another is a low chassis model with camouflage paint and a roll bar. The #244 and 290 versions of the CJ-5 have a lifted chassis and large off road tires. The "Golden Eagle" model was carried over to this chassis but became black with a yellow top. 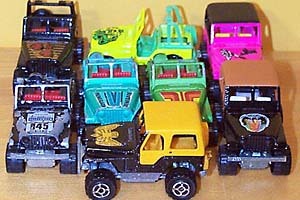 There has been a variety of other paint schemes, some with roll bars instead of hard tops. A 2002 Extractor series version (70K JPEG) was available either way. Some early models (like the Dallas TV Show CJ-5, 30K JPEG) have no top or roll bar at all. Other recent examples include a 2002 fire Jeep and a 2005 airport Jeep with trailer. A quite accurate copy of the Majorette CJ-5 (40K JPEG) was made by Metchy of Hungary. Also on CJ3B.info, see Majorette Large Diecast Jeeps and Majorette Diecast Cherokees. Elsewhere on the web, Toshimi Ohashi's Diecast Models Collection has a large photo-reference of Majorette Jeeps.